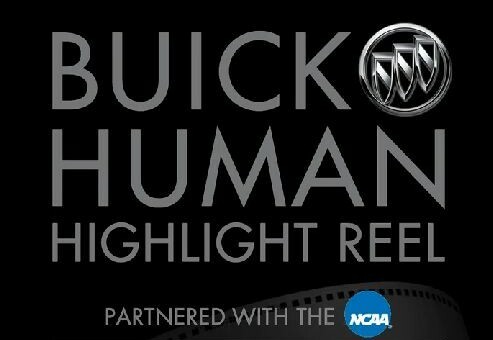 Earlier this morning, Buick held a press conference at the Detroit YMCA to announce its sponsorship of the NCAA tournament with the “Human Highlight Reel,” a collection of inspiring stories of former NCAA student-athletes who graduated and went on to make significant impact on the world. From a marketing standpoint, General Motors VP of marketing Chris Perry explained that they hope the messages reach out to consumers looking for a brand representing “substance over success” and active in humanitarian efforts. Present at the conference was former South Dakota University basketball player Emmanuel “Manny” Ohonme, a charismatic native of Nigeria who founded Samaritan’s Feet, a nonprofit organization that has provided shoes to millions of children in over 40 countries. His story will be one of the many shared through the Buick Highlight Real Ads. Along with ads running between the action of March Madness, Buick will also have a live presence at Bracket Town in Houston during the final week of the tournament. Previous story GMA Opinion Desk: Is The Chevrolet Volt Society’s Paradigm Shift?